Strength in local expertise…strength in global supply. 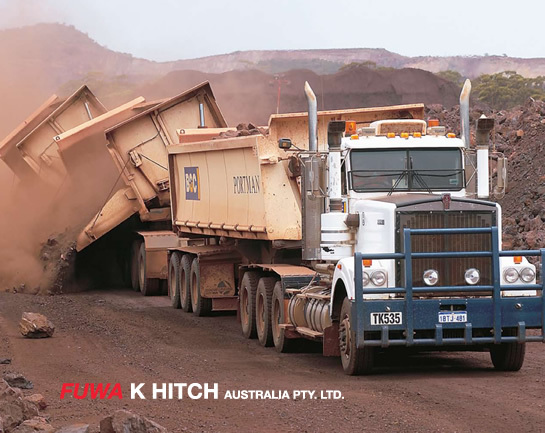 Starting out as a specialised designer and supplier of transport components to the Western Australian mining and transport industries, FUWA K Hitch has expanded to become a leading supplier of trailing equipment to the Australian transport industry. A subsidiary of FUWA China, the Australian market has provided an ideal testing ground for FUWA products and is seen as an essential part of establishing a global reputation for strong, high quality products that can operate in the harshest of environments. With a strong focus on product research and development, FUWA is working tirelessly to improve their designs and manufacturing techniques. Currently, the FUWA global manufacturing facility produces in the vicinity of 800,000 axles, 200,000 landing gear sets, 40,000 suspensions and great numbers of fifth wheels, king pins, slack adjusters and other components per annum. With their Australian head office in Derrimut, Victoria, FUWA K Hitch incorporates the national sales and distribution of the entire product offering, as well as the final assembly of the K Hitch range of axles, brakes and both airbag and spring suspensions. Combining the global manufacturing strength of FUWA China, with equipment that is purpose built and tested for the Australian market, you can’t go past FUWA K Hitch. Get with FUWA strength and join the world’s leading force in trailing equipment.